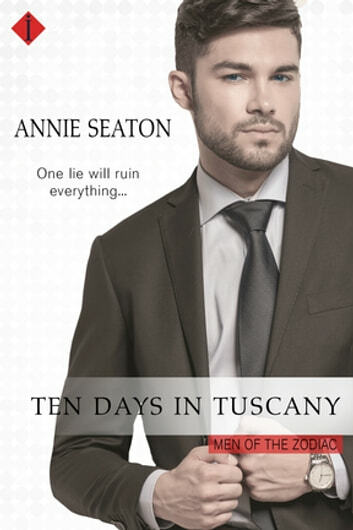 Annie writes so vividly that she took me right to Tuscany in Ten Days in Tuscany. I loved her descriptions of the place, the paint, and the people. Gia and Nic are main characters who are both unhappy where they are in their lives, living how other people think they should. After a chance meeting, they connect strongly, and a love of art is what initially brings them together, and a powerful chemistry makes it all the more fun. Nic can see all the potential Gia has but that she can't see. Spending time together brings them much closer together, and their whirlwind relationship is quick but believable. I really liked Gia and could feel for her...wanting to please her family, but having her own desires too. It is a fine balance to try to achieve both, and she just might have to start thinking of herself first. Nic is a big help for Gia, he inspires her, makes her feel, and makes her believe in herself. I liked how Nic and Gia gave each other strength...and I couldn't wait to see if they would both also find the courage to do what was right for them. I wasn't as fond of Nic because I felt that he was keeping a secret that would hurt not only him, but Gia as well. I liked how Annie wrote in the family dynamics in Ten Days in Tuscany, and how this plays a big role in the plot. I like how she wrote it, how it was dealt with, and how the family's ended up being. Being who you need to be for yourself is difficult sometimes, but a bit easier when you have someone by you side. Ten Days in Tuscany has is a great, flowing book and it was easy to stay in the here and now of the story! I'd recommend Ten Days in Tuscany to any romance reader looking to be swept away in an artfully set romance! I really loved this book! I found the whirlwind romance of Nic and Gia touching and thought both characters became better, stronger people because of the love they found. Nic has everything, rich, strong family, good business sense, but it all seems to be strangling him. For a much needed break he goes to a small village in Tuscany where he meets the incomparable Gia. She is an amazing artist but is working in her families restaurant rather than pursuing her artistic desires. Nic works to convince Gia that the world needs to see her art but never once does he reveal his true identity to her. When the secrets are revealed their new love will be put to the ultimate test. This is a good one, I definitely recommend it! This is the story of Nic and Gia. Nic is a rich man who wants to have the right to paint and enjoy the arts. His family, and his father in particular want him to work at the family company and like it - as they do. Gia has a family who steamrolls over her, since she is the baby. Gia works as a waitress in her family's restaurant. Her father thinks she should only settle down and get married. He wants grandchildren. He does not see the talent she has and is vital to her being. Nic has a family who has refused him the right to attend an arts academy. Before his mother died, he promised he would keep the art in him alive and paint often. Now, with her gone, he realizes he has not done that and takes a ten day vacation - where he literally bumps into a gypsy woman who captivates him. Gia is not sure if she can believe everything Nic tells her. She has been told all her life her "little hobby" is nothing more than a nuisance, since she should be doing what they say she should do. Her family - mostly her father - does not see the passion it ignite in her. Nic does, and he unleashes a passion for her all his own. I found the characters to be solid in their dreams and their desires. The chemistry is also very hot. The plot just went a little slower than I am used to. But good book to curl up with. ***This ARC copy was given free from Netgalley.com and its publisher. My honest opinion does not reflect Netgalley, nor its affiliates. 4.5 Stars Gia Carelli is a waitress at her family's restaurant but she's an artist at heart. When Nic Baldini vacations in Tuscany and meets this beautiful budding artist, he realizes he must help bring her to the attention of the world of art. He's learned from her father that the Baldini name is not welcome in their little village because when he remodeled the family villa, he hired craftsmen that were not local. He has to keep Gia from finding out who he really is. How can he do that when he finds himself spending every moment he can with her, in and out of bed. Gia's family is extremely overbearing. They act as if she doesn't have the capacity to form thoughts and make decisions for herself. These two people are struggling to find their way and accomplish their dreams as their families discourage them at every turn. The way this author writes makes me feel like I'm in the story watching it unfold. I can picture things like the roads, the fields, Gia's cottage, and her family working in the restaurant. I love it when an author pulls me into their story so completely. I can't wait for the next book from this amazing author. Received a copy in exchange for an honest review.